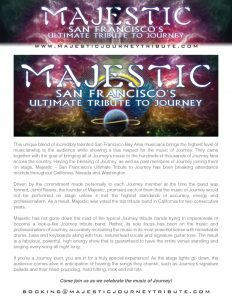 This unique blend of incredibly talented San Francisco Bay Area musicians brings the highest level of musicianship to the audience while showing a true respect for the music of Journey. They came together with the goal of bringing all of Journey’s music to the hundreds of thousands of Journey fans across the country. 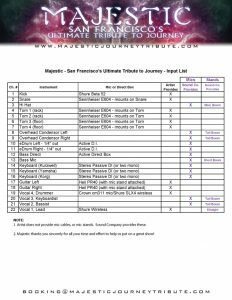 Having the blessing of Journey, as well as past members of Journey joining them on stage, Majestic – San Francisco’s Ultimate Tribute to Journey has been breaking attendance records throughout California, Nevada and Washington. 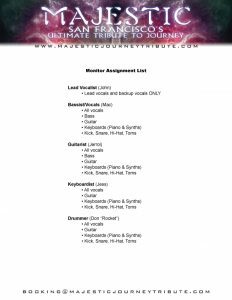 Driven by the commitment made personally to each Journey member at the time the band was formed, Jerrol Reavis, the founder of Majestic, promised each of them that the music of Journey would not be performed on stage unless it met the highest standards of accuracy, energy and professionalism. 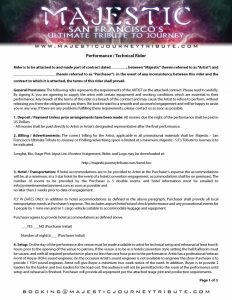 As a result, Majestic was voted the top tribute band in California for two consecutive years. Majestic has not gone down the road of the typical Journey tribute bands trying to impersonate or become a look-a-like Journey tribute band. Rather, its sole focus has been on the music and professionalism of Journey, accurately recreating the music in its most powerful sense with remarkable drums, bass and keyboards along with true, natural lead vocals and signature guitar tone. The result is a fabulous, powerful, high energy show that is guaranteed to have the entire venue standing and singing every song all night long. If you’re a Journey lover, you are in for a truly special experience! 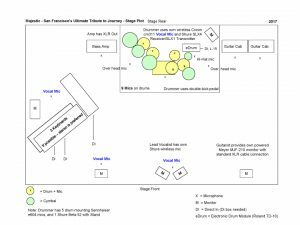 As the stage lights go down, the audience comes alive in anticipation of hearing the songs they cherish, such as Journey’s signature ballads and their heart pounding, hard hitting, rock and roll hits. Come join us as we celebrate the music of Journey!